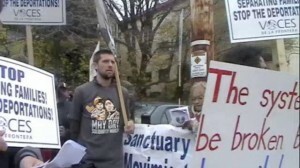 Dozens of activists gathered in front of the Immigration and Customs Enforcement agency (ICE) in Milwaukee Thursday afternoon to call on President Obama and a newly elected Congress to make real changes to federal immigration and deportation policy. Voces de la Frontera Action organized the rally and vigil in coordination with the Fair Immigration Reform Movement, who is leading these types of actions nationwide for 72 hours after the election. Activists are calling for humane immigration reform in light of more than one million people having been deported over the past four years, separating hundreds of thousands of families. Speakers at the rally include (in order of appearance in video) Clara, Christine Neumann-Ortiz, Jennifer Martinez, Salvador Rojas and Lizeth Zorilla with Nancy Flores of Voces de la Frontera translating. Immigrant rights leaders call for reform and point to the record turnout of Latino/a voters this election cycle. There was an unprecedented voter turnout of Latino/a voters, the majority voting to re-elect Barack Obama to a second term. In Milwaukee and Racine, Voces de la Frontera and their youth branch, Youth Empowered in the Struggle, led a massive Get Out the Vote effort in heavy Latino/a wards, knocking on nearly 25,000 doors. “We are giving President Obama a second chance to deliver on his promise of federal immigration reform and really build the kind of political will that is necessary to make that happen,” said Christine Neumann-Ortiz, executive director of Voces de la Frontera. Neumann-Ortiz said that Obama’s recent policy of deferred action for youth was a motivating factor in the large numbers of support for Mr. Obama. Deferred action for undocumented youth was put into effect June 15 by the Department of Homeland Security. Five criteria must be met to be eligible, including came to the United States before the age of 16; have resided in the United States for the past five years; are currently in school or have a high school diploma or equivalency; have not been convicted of a felony or several misdemeanor offenses; and must be under the age of 30. Activists are demanding more from the Obama administration such as extending deferred action to more people beyond the criteria established for youth, a path towards citizenship, education reform such as the DREAM act and that a real implementation of prosecutorial discretion be used when reviewing deportation cases. ICE implemented a policy in 2011, that they would be using prosecutorial discretion when considering deportation cases. The agency stated they would not follow through with deportation proceeding cases that were of low priority, which includes people who have been living in the United States for a long period of time, have a family in the US and have no criminal convictions. Salvador Rojas is currently calling for prosecutorial discretion as he has lived with his family in the US for over a decade with no criminal history. Jennifer Martinez’s, who as we previously reported, husband Jaime was deported earlier this year leaving her family separated with Jaime in Mexico and Jennifer with their four children in Manitowoc, WI. The Martinez family had also applied for prosecutorial discretion for Jaime, but were determined ineligible though he had been living in the US for a long time with his family and no criminal background. Jennifer and her children had moved to Mexico earlier this year to be with her husband, but moved back to Wisconsin because of violence in their town. She says her husband now makes about $28 a week in Mexico, making it impossible for their family to not be on public assistance to get by. “I’m demanding [Obama], actually, to keep his promise. I mean we stood up for him, now its his time to stand up for us,” Martinez said. Tracey Pollock, a native of River Falls, Wis., studied journalism at UW-River Falls and finished her education at UW-Milwaukee with a focus in sociology. She is interested in covering social justice issues and shedding light on issues in a way that corporate media will not undertake. Pollock lives in Milwaukee, where generations of her family have resided. She enjoys the local music scene, bicycling and camping. Jennifer Martinez is a US citizen living in Wisconsin with four children. Her husband of 14 years and the sole provider of income for the family has been deported to Mexico. Trump appeared to take delight in the disruption he has caused in his first week in office. "Everybody's talking about it." Obama Calls Trump Mexico Plan "Half-Baked"
President Obama's intention was to make an economic argument that Democrats present the best option for working and middle-class families. It's an argument that he hopes will help Democrats in this November's congressional elections.